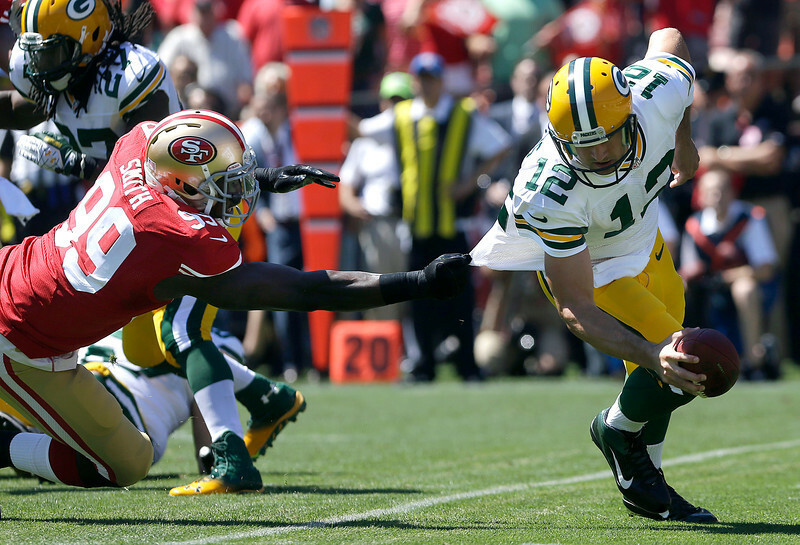 Expectations for the 2013 San Francisco 49ers have never been higher. Most faithful have headed into this season with a "Superbowl or bust" mentality. In that vain, The Section brings you the group text message discussion of three die-hard Niner fans the morning after SF's huge Week 1 victory over Green Bay. Kevin, Devin and Josh all poured over the game tape on Sunday night, and came to the table on Monday with plenty of opinions on Jim Harbaugh's #Squad. Next up for the Niners will be the Seattle Seahawks, and the Sunday Night Football tilt against a hated division rival will surely be a tough road test. Kevin: Kap didn't look great throwing the ball. Some bad misses. GB defense is bad enough that he had laughable numbers. Worried about when we play Seattle or whoever doesn't have windows for WR's you can drive a truck through. Devin: Running game was poor too. Def some concerns for next week. Kevin: ESPN narrative will be "How to stop Kap." The Section: What will Sec925's narrative be? Kevin: Vernon looked great also. In trenches and in routes. Josh: Whitner had a nice game too. Was all over the field. Kevin: Sure, Reid as well. Josh: We might have let our X-factor out too early though by letting Boobie get that 30 yard return in Week 1. Kevin: Aldon looks good with untucked shirt this season. Josh: Boldin will get fined for the black shirt. Did you notice the Ravens pads too? I like all black Boldin though. Devin: Concerns: Penalties (11). The run game was only effective late. Harbaugh and the refs (gotta chill a bit). Thought Nnamdi did pretty well, Reid looked great, run D is awesome, D line got pressure, Kap is the man, Boldin and Davis looked great.... Another concern: getting the f@#$ing play off on time. Josh: Clock management has been the team's weakness the past three years. I'm not as low on Kap as Kevin. I thought he did a nice job and don't forget the balls that Moore and Williams and McDonald dropped. I am a little more concerned about Nnamdi because he missed some tackles and save the third down in the 4th quarter he didn't look great. Missed tackles on the defense was a killer. How many times did Jordy Nelson stretch 5-yard catches into first downs? Devin: Two of those grabs were amazing and only 1 was on Nnamdi. The other was on Brown and Reid missed a tackle on one. Clock management in Seattle is going to be huge for us. The Section: Frank Gore averaged 2 yards per carry. Devin: This was the first time the offense played any significant time together. Could be a little rusty. Devin: "If intimidation is your game plan, I hope you have a better one." - Colin Kaepernick. Josh: Mondays on KNBR after a big Niner win are spectacular too. Anyone concerned about Willis only getting 5 tackles? Kevin: No. Thought Willis looked good. Don't have data to prove it but seemed like LB's removed the middle of the field pretty effectively. Deep middle, outs and some flats/sidelines aren't P Willis' responsibility in general. Also, I just assume anytime ARog scrambles and sets, that's automatically a 40 yard tip-toe catch for Jordy. Devin: First game he's played in since the Superbowl. As Kevin said, lots of passes seemed to go outside. Thought they did a nice job of taking the seam routes away. Josh: Me neither. Just wanted to get a consensus. Turning to our readers now... your thoughts?